Unbeaten but unheralded American heavyweight hopeful Charles Martin won the vacant IBF title when Vyacheslav Glazov was unable to continue after suffering an injury to his right knee in the third round of their fight on Saturday in Brooklyn, New York. 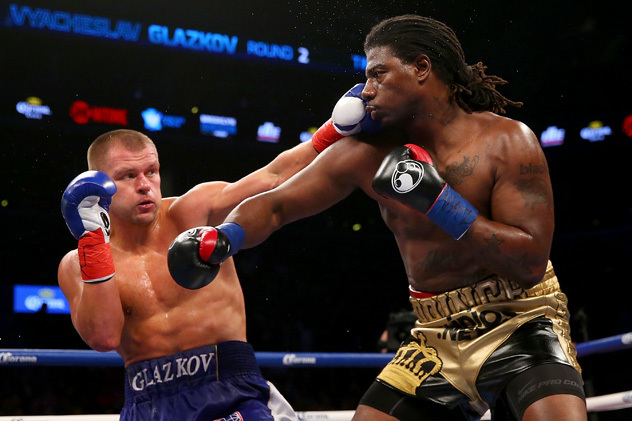 After two uneventful rounds, Glazkov (21-1-1, 13 knockouts), THE RING’s No. 7-rated heavyweight, slipped to the canvas after landing a right to the body of Martin early in the round. The 31-year-old Ukrainian may have injured his knee with the fall because he got up with a slight limp and seemed to box in leery fashion afterward. BROOKLYN, N.Y. – It was a coming out party for Polish heavyweight prospect Adam Kownacki (13-0, 10, Knockouts) as he dominated Danny Kelly (9-2-1, 8 KOs) for eight rounds in front a large Polish crowd at Barclays Center. Kownacki won by scores of 80-72 (twice) and 79-73.